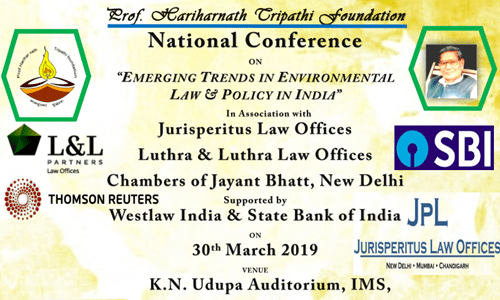 Prof. H. N. Tripathi Foundation National Conference on "Emerging Trends in Environmental Law & Policy in India" will be organised by BHU, Varanasi on March 30, 2019. •	Agriculture and conservation of biodiversity. •	Abstracts not exceeding 300 words on any of the aforesaid themes should be sent to the Organizing Secretary through email at hntripathi17@gmail.com on or before 10 March 2019. •	Intimation of Acceptance of Abstract within 3- 4 working day of submission (if accepted). •	All Papers and Abstracts shall be sent via e-mail to hntripathi17@gmail.com as an attachment, the subject of which should mention 'ABSTRACT SUBMISSION' or 'PAPER SUBMISSION' accordingly. •	No co-authorship is allowed, only single-authored papers are allowed. •	The participants are expected to avoid plagiarism as far as possible and submit original papers only. Thus, any previously published material shall not be accepted.